Will Rodman (Franco) is a genetic engineer working on a cure for Alzheimer's. He has been testing a retrovirus on chimpanzees. The retrovirus causes the brain to reach human intelligence levels. 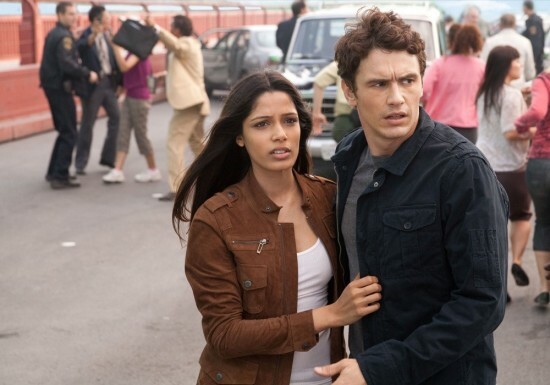 After a chimpanzee escapes her cage and destroys the office, Will's assistant is forced to kill all of the chimps. 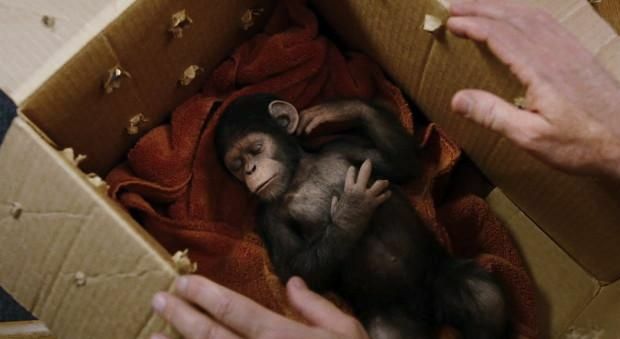 A baby chimp is left, and Will takes it home to rescue it. The Alzheimer's project is shut down, but Will won't give up his fight for a cure. His father (Lithgow) is slowly losing his battle to Alzheimer's. Will decides to test the retrovirus on his dad. His dad starts to get better as his memory and motor skills return. They name the chimp "Caeser" and decide to raise him in the house. Will notices that the retrovirus has been passed down to Caeser (Serkis). Caeser starts to develop at an astonishing rate. Will fights to get the retrovirus back in the lab and for the research to continue. Slowly, his dad's immune system starts to fight the antivirus and his Alzheimer's comes back. He gets into his neighbor's car and crashes it thinking that it is his car. He gets into an altercation with his fuming neighbor leaving him shaken and confused. Caesar witnesses this and tries to come to the rescue by attacking the neighbor. Animal control is called, and Caesar is taken away. Caesar is now held captive with numerous other primates by John Landon (Brian Cox) and his son, Dodge (Felton). The primates live in terrible conditions. With his advanced intelligence, Caesar spends his time planning his escape. 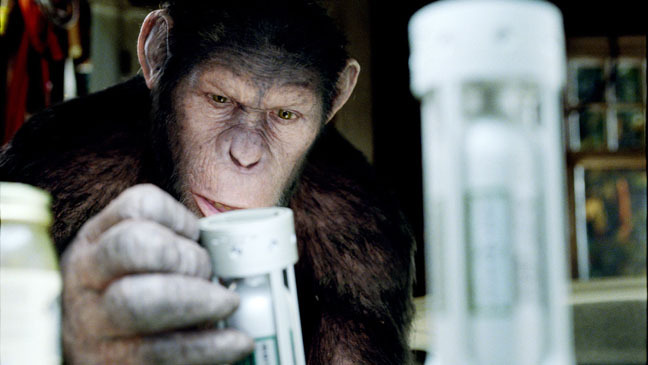 Rise of the Planet of the Apes is the first in the Planet of the Apes series to use all performance capture technology by Weta Digital. Weta Digital is the same company used on The Lord of the Rings and the King Kong remake. There were no actors in ape costumes or make-up. Andy Serkis has become a master at performance capture acting. His characters are always fully formed even though you don't see his physical appearance on screen. Serkis' amazing performance as Caeser is by far the best acting in the movie. The apes escape at the end is the best part of the movie. You really are at the edge of your seat as you watch the apes take over the Golden Gate bridge. I wish the rest of the movie could have been as exciting as the ending. 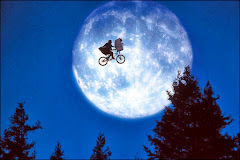 Even though it has an interesting premise, the screenplay could have been better. Many of the supporting characters are merely stereotypes that cause some bad acting and bad line readings. Tom Felton plays your average evil sidekick villain that treats the apes badly. Freida Pinto plays your average supportive girlfriend. Overall, Rise of the Planet of the Apes is a good movie that takes a new direction in the series. Make sure to watch the credits before you leave. There is another element to the story that unfolds that I found intriguing. Steve Rogers (Evans) is short and scrawny, but he is determined to enlist in World War II. He tries to enlist four different times using false information but is rejected each time due to his stature and asthma. On his fifth attempt, Dr. Abraham Erskine (Tucci) allows him to enlist as part of an experiment to create a "super-soldier". Steve agrees because he will do anything to fight for his country. In front of a panel of scientists and war officials, Steve is hooked up and injected with some special serums and "vita-rays". Steve emerges insanely muscular and with extraordinary abilities like: super strength, running fast, and swimming underwater. 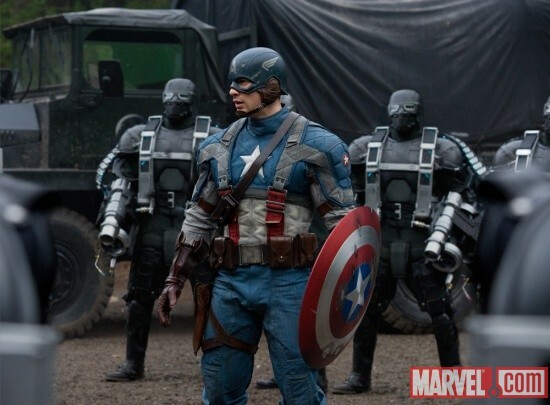 Steve becomes the model soldier and is branded the name "Captain America". Captain America is the symbol for the all-American soldier saving his country. Captain America teams up with Agent Peggy Carter (Atwell) and Colonel Phillips (Jones) to defeat the HYDRA organization. 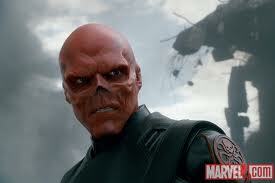 The HYDRA organization is led by Johann Schmidt (Weaving), aka "Red Skull". Schmidt along with his side-kick Dr.Zola (Toby Jones) have stolen a magical cube containing enough energy to destroy mass quantities of people. Schmidt's goal is to take over the war like Hitler has and destroy numerous American cities by the energy he uses from the cube. Captain America invades Schmidt's fortress and rescues numerous soldiers that have been held captive. They battle Schmidt's army, but Schmidt and Dr. Zola escape. Captain America figures out where they are headed next. He gathers the troop one more time to finish Schmidt off and save America. Captain America: The First Avenger is the last of the four comic book movies to come out this summer. At the end of the movie, Samuel L. Jackson has a cameo as Nick Fury, who has had appearances in some of the other Marvel comic book movies. The filmmakers also included that Captain America will return next summer in The Avengers. Chris Evans is wonderful as a super-hero. He has the look and sense of humor included with being a good super hero. Tommy Lee Jones plays Colonel Phillips exactly the way you would expect him too. He's your standard Tommy Lee Jones type of character with well delivered one-liners. Of the four superhero movies releases this summer, I would rank this second behind X-Men: First Class .